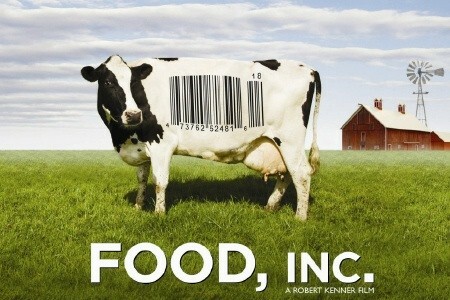 We watched the documentary film called Food, Inc this week. My world was rocked. Basically, the movie poses the question, “where does our food come from”. It wasn’t that all the information was new to me. I already knew chickens are overfed and overcrowded in chicken coops around america. I know most of our food is genetically modified. But the movie hit a nerve and I can’t shake it. After chewing on the film for a few days (ha, no pun intended. okay, maybe it was.) I think, at the core, what bothers me is that it’s not just one industry that seems to be messed up…like beef industry or the chicken industry and I can just say, I’ll never eat ____ again. It’s that ALL commercial food industry is messed up in one way or another. We aren’t eating good food. It’s all connected. It’s all messed up. Whether it’s how the animals are treated, fed, or slaughtered or how our veggies are grown and covered in pesticides, or how the FDA isn’t really regulating the way they should, or how the workers who process the food are poorly treated. (FYI, the movie didn’t come across as a political propaganda film. It actually blamed both parties.) It all seems pretty messy and honestly, too big for me do anything about it. This leaves me perplexed and not sure what my next move is…let alone what my next meal is. Needless to say, I haven’t had much of an appetite the past few days. Eggs alone were $4. Chicken nuggets $7. Crazy. We live on a budget, so going all organic at this point in our lives isn’t really an option. BUT, I want my kids to eat good food. I want to eat good food. I know eating well now will mean being healthier later. So where is the middle ground? Although we are generally an all of nothing kind of family, I think the answer for us is figure out what our “nonnegotiable” are. In other words, what are the items that I will ONLY buy organic. Milk, for example, is an easy one. We have been buying organic milk for the past several years. We don’t even hesitate at the store. What other items need to be added to that list? After seeing the film, I think eggs and meat are going on the top of the list. If you shop for organic foods what are your nonnegotiable? In other words, what are the items that you will only buy organic? Where do you get deals on organic foods, how do you work it into your budget? Chime in, I need some help here. Saw the movie two weekends ago & it rocked my world too. My trick up to that point had been to go coupon crazy with the non-organic stuff so that I could justify spending money on organic food. My non-negotiable is definitely produce. Although I will buy non-organic produce if it is local (farmer’s market, my grandparent’s garden, etc.). I am going to try and add meat (particuarly beef) to the non-negotiable list. Chicken is TOUGH to get on the list ’cause it’s so dang cheap & we eat so much. But, I figure starting with beef is a good step. I actually enjoy the taste of grass-fed beef much more, so that shouldn’t be too tough of a switch. So far, all of the food I’ve made for Berkley is organic. I’m hoping that if I start with him & only feed him organically, that it will slip into my own eating so that by the time he’s 5 or 6 we are eating primarily organic food as a household. I don’t think it’s something we can do overnight, but will be done with gradual steps & gradual budgetary sacrifices. Ah, the stress of trying to balance good food on a budget – we know that well at the Cozart house! I’ve done some research on the subject, and what I have found is that generally, if you can only spend a small amount on something organic, you’re right to start with meat and dairy products. Those are where you definitely get the most bang for your buck in terms of the difference between organic vs. non-organic. As for other food items, like crackers, cereals, etc., a good rule of thumb is to look for products with fewer than 5 ingredients or those made with true whole grains (look for whole wheat flour as ingredient, as opposed to something with the words “bleached” or “enriched”). This will limit the chemicals and amount of processing that goes into production. I’m a big fan of Triscuit crackers (only whole wheat, oil, and salt) and Kashi cereals. There are also some whole wheat pastas you can find that fit this category, as well as marinara sauces, that may just be with the regular food and not in an organic section. Publix has a great selection of this stuff here in town – I haven’t had much luck finding things at Wal-Mart. I hope this helps, and if you learn any more good tips, please share! Happy cooking and shopping! GREAT info Deanna! Thank you!! Dairy, fruit, veggie, bread and meats are our non-negotiables:). OK…so my chocolate probably isn’t organic. To save $ we have our own blueberries, raspberries, apples, tomatoes etc growing in our yard:) Of course those are seasonal but so is organic…but it does help! Food Inc. is on my list of “need to watch a.s.a.p., but, in the meantime, i’ve tried to do as much “research” as possible on my own. I got a book you may be interested in reading. Its called “the Kind Diet”. half book half cookbook. I was skeptical at first because it is written by Alicia Silverstone and I’m always skeptical of fads from media figures. But its been a TON of great information. I recommend reading it if you can get ahold of a copy. I’m really at a crossroads as well. over the years i’ve developed TONS of food allergies and have cut out a lot and I think a lot of it may have to do with processed foods, preservatives, etc. so i’m interested in how this all works out for me. I struggle with the same stuff. Fortunately, my in-laws raise their own beef and pork…so I get that from them. That is the only thing right now that I insist on. When we run out of ground beef…we’re beefless. After tasting the real stuff…I can’t just go to the grocery store and pick up a couple pounds. Bleck! We have a great trader joe’s by us, but yes….more expensive is the problem! I am a lot more strict on what my son eats vs. what we eat…but I think that’s normal. I think you have a good start- milk, eggs, and meat are non-negotiable for us. Anything that comes from an animal that can be pumped up with hormones and steroids. I’ve always wanted to get a big freezer and go in with a few families in our church and buy a local cow and have it butchered and split up the meat. I think part of the budget problem is that we all buy our food in little bits at the store- maybe bulk buying is the answer? Don’t you live in Atlanta? What about Trader Joes. I know not everything is organic, but all of it is not processsed. It is a good balance. We do all of our shopping there. It is pretty cheap. no trader joes in my town. 😦 But believe me, I have been to their website many times begging them to come!! Interesting topic… I have been thinking about this as well…I have enjoyed all that was said. i might have to check out that movie sometime!! Long before we watched Food INC, we read a book called the 100 Mile Diet: A Year of Local Eating. Since then, we have tried to eat as much food produced locally as possible. If there is a choice between local and organic, we will choose local, and if it is local and organic we love it even more!!! We are on a $150 per month food budget for a family of four (as of 3 weeks ago when our sweet girl came home from Ethiopia). Sometimes we can get by with $100 per month. We live in Portland, so I can’t advise you on specific places to shop, but we try to go directly to the farms as much as possible, as that is even cheaper than farmer’s markets – which here tend to be spendy. Mambo Sprouts has a coupon book with natural food products – if that is available where you are – go to their website and put in your zip to find out. We make most of our own bread – we buy grains at Bob’s Red Mill, a local mill. Here in Portland we have also have a coupon book called the Chinook Book which has tons of manufacturers coupons for natural foods and also many local markets, farms, and places like Bob’s Red Mill (for example – I buy a 25# bag of organic flour with a 50% off Chinook Book coupon and pay $12.50 instead of $25, etc) Do you have anything like the Chinook Book where you are?? We have our own garden, and can applesauce (organic, free from a friends apple tree), tomatoes, etc. We love that our 30 month old daughter knows where food comes from, instead of thinking it just comes from the shelf in the grocery store – one of the added benefits of going to the source! 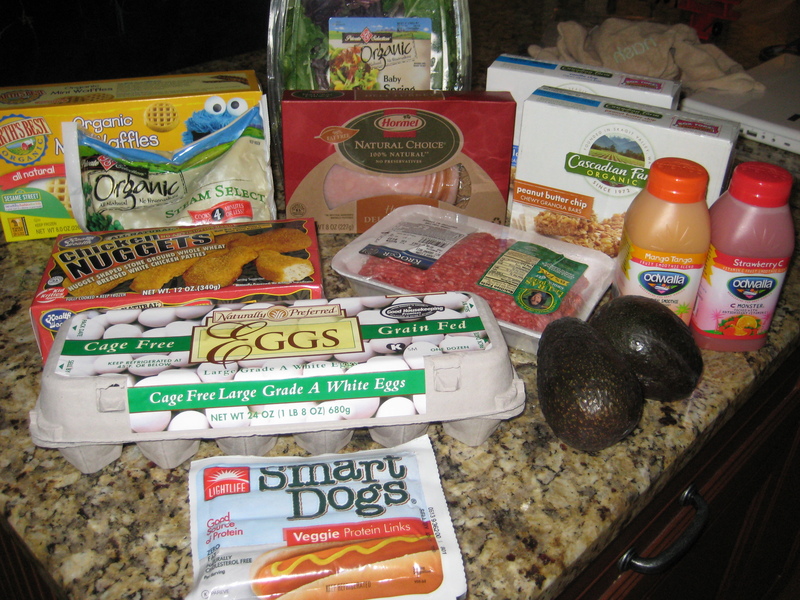 It is a fun adventure finding thrifty ways to eat healthy food that you know was processed minimally/treated right! Thanks for posting sarah. love your thoughts and wisdom. I’m hoping to can some this coming summer. I grew up on homemade bread and thought people only got “store bought bread” on their birthdays like me. 🙂 My mom canned everything as well…i’m wishing i paid closer attention now that I’m starting do this on my own! I was blessed to have a good friend offer to teach me to can…..same friend with the apple tree in her yard! We spent a completely fun day as a family a year and a half ago picking apples and turning them into shiny rows of canned applesauce. She also blessed me with all the supplies I needed for canning and her cell # for when I was doing it on my own! I forgot to mention that Craigslist can be a place to find local farmers, eggs, produce, etc – at least here the farm/garden section is full of people selling seasonal produce, free-range eggs, and meat. My advice is to commit to little changes and stick with it over time as you add more. We garden, have chickens, grind our own wheat to make bread, make our own yogurt, pick strawberries, blueberries, can the summer produce BUT we didn’t do it all at once. (In fact, about 6 years ago a friend gave me some food she’d canned and I threw it away. Home canned food totally freaked me out!) It’s a rewarding journey to know that you’re feeding your family food that is grown locally and naturally, but for me it’s been a journey more than a sudden life change. The first thing we started with was gardening. Besides getting the FRESH organic produce, we saved enough grocery money that we could buy the more expensive dairy products without changing our food budget. I don’t think I’ve ever commented before, so I’ll just take this opportunity to say I love your blog! Hey Sara! it’s nice to “meet” you! Thanks for the great advice. I’ve been having a lot of fun with this transition to organic/better lifestyle. You are so right, it’s going to be gradual…but we are learning more and more each day! Can’t wait to start my garden…i’m a little intimidated though!